Perfect for fans of Debbie Macomber, Kristin Hannah, Beth Hoffman, and Kate Jacobs, this luminous novel from the author of "Friendship Bread "follows""a group of fascinating women who form deep friendships through their love of scrapbooking--as memories are preserved, dreams are shared, and surprising truths are revealed. At Madeline's Tea Salon, the cozy hub of the Avalon community, local residents scrapbook their memories and make new ones. But across town, other Avalonians are struggling to free themselves of the past: Isabel Kidd is fixing up her ramshackle house while sorting through the complications of her late husband's affair. Ava Catalina is mourning the love of her life and helping her young son grow up without his father. Local plumber Yvonne Tate is smart, beautiful, and new to Avalon, but finds that despite a decade of living life on her own terms, the past has a way of catching up--no matter where she goes. And Frances Latham, mother to a boisterous brood of boys, eagerly anticipates the arrival of a little girl from China--unprepared for the emotional roller coaster of foreign adoption. Enter Bettie Shelton, the irascible founder of the Avalon Ladies Scrapbooking Society. Under Bettie's guidance, even the most reluctant of Avalon's residents come to terms with their past and make bold decisions about their future. But when the group receives unexpected news about their steadfast leader, they must pull together to create something truly memorable. 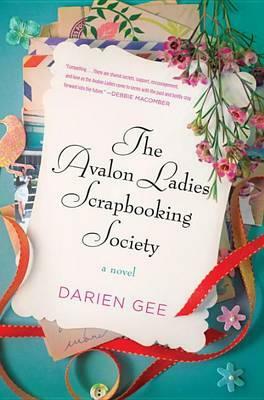 By turns humorous, wise, and deeply moving, "The Avalon Ladies Scrapbooking Society" is a luminous reminder that the things we hold most dear will last a lifetime. "There are many threads to this story (including a female plumber with a secret past), but, like a good scrapbooker, Gee puts them all together beautifully. Bettie is the glue that holds the residents of Avalon together--whether they like it or not--and as she seems to unravel, the town comes together. This funny, moving book is the follow-up to "Friendship Bread" (2011), although "The Avalon Ladies Scrapbooking Society" can stand on its own. A welcome addition to any women's-fiction collection and a good choice for fans of Debbie Macomber's knitting series." --"Booklist"
"A three-hanky nod to "It's a Wonderful Life." Gee--who also writes as Mia King ("Table Manners")--gets the unapologetically schmaltzy tone just right with the irresistible premise that we can love the impossible. A surefire book club hit." --"Publisher's Weekly"
Praise for Darien Gee's "Friendship Bread"
Darien Gee lives in Hawaii with her husband and their three children. She is also the author of "Friendship Bread."